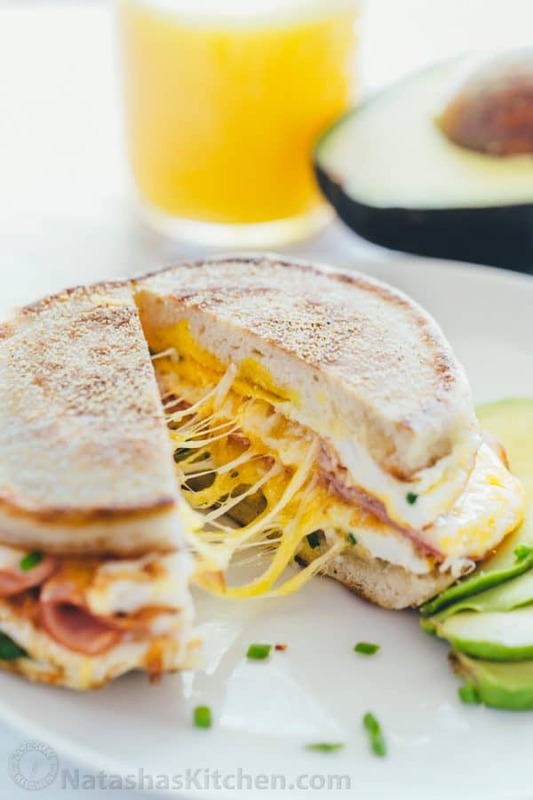 This breakfast sandwich is cheesy, juicy, easy and so darn delicious! 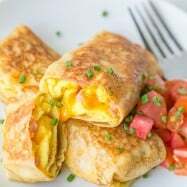 All you need is 5 minutes, 5 ingredients and 1 pan – perfect for breakfast on-the-go! 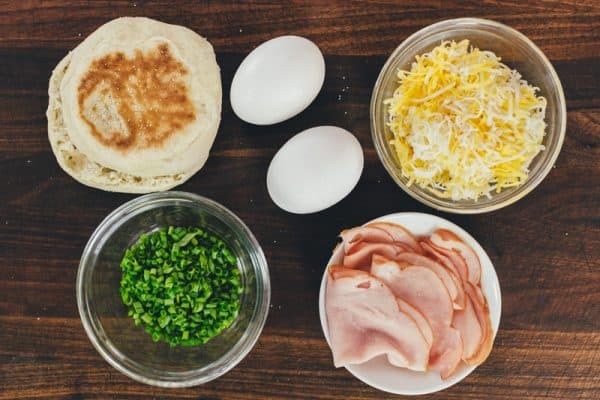 This breakfast sandwich is loaded with eggs, ham and cheese and is hugged by a warm English muffin that toasts in the same pan. And it can all be cozied up between your fingers… Yuuum! This recipe has completely won us over. 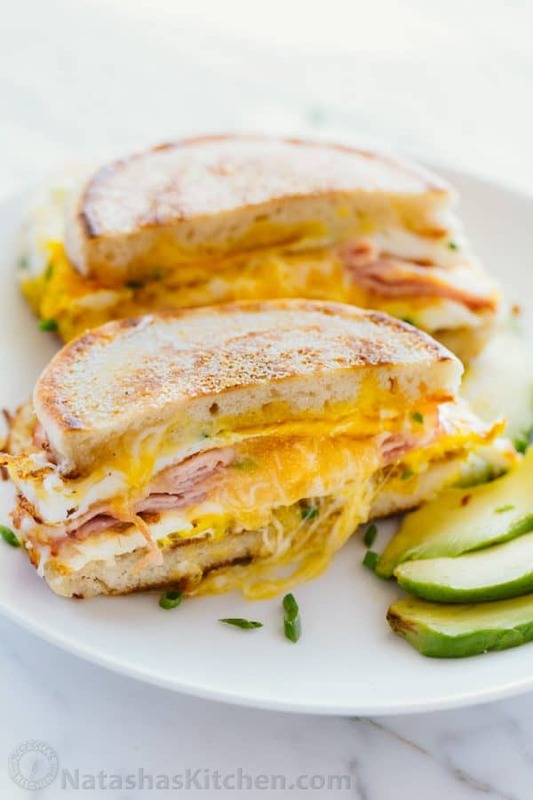 The inspiration came when My husband’s cousin Vicky shared a video on Facebook for a breakfast sandwich. After making our version 4 days in a row, we knew it needed to be shared with you. This is also a kid-friendly breakfast. 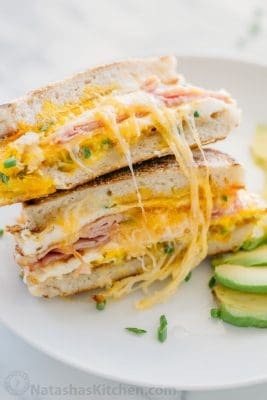 Our son requests this sandwich all the time. Tip: to make 2 sandwiches at a time, toast the English muffin in the toaster and sauté two sets of eggs in the pan. This video was really fun to film. If your mouth is watering by the end, let me know in a comment below ;). We hope you subscribe to our Cooking Channel to be the first to see our new videos. Thank you so much for subscribing! It really is so encouraging to us. Heat a large non-stick pan over medium heat and drizzle with 1 Tbsp oil. Place your Engish muffin on half of the pan cut-side down. Crack 2 eggs side by side on the other half of the pan and break the yolks with a spatula. 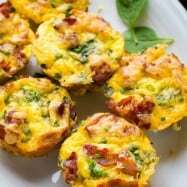 Once eggs are mostly cooked through, sprinkle tops with salt and pepper to taste, 1 tsp fresh chives and half of shredded cheese. Place toasted english muffins cut-side-down over the eggs and lightly press on the tops with a spatula. 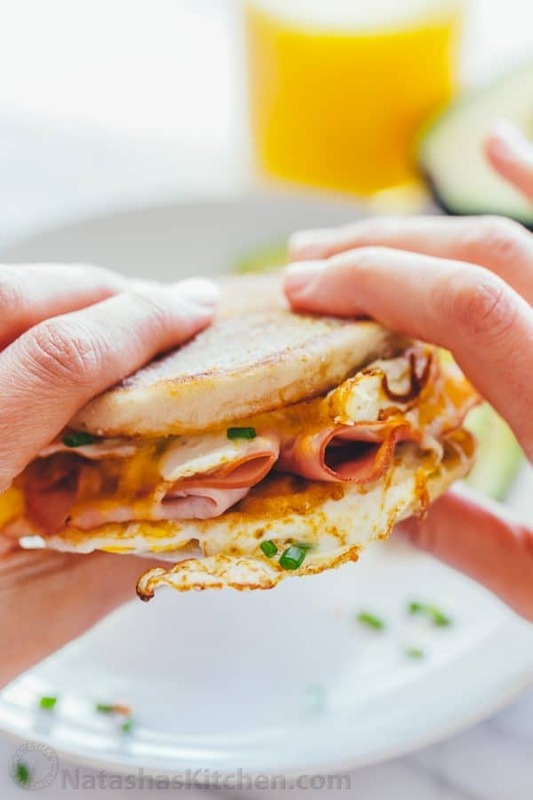 Flip the sandwich over (egg-side-up). Place ham over half of your sandwich and top with more cheese. Fold the sandwich together and and remove from heat. You can easily scale this recipe up or down depending on how many mouths you're feeding. To make 2 sandwiches at a time, toast the English muffin in the toaster and sauté two sets of eggs in the pan. 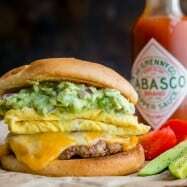 What is your go-to quick breakfast? As a breakfast sandwich addict, couldn’t wait to try this. Now on my fourth time and so call for a comment. It was great!! 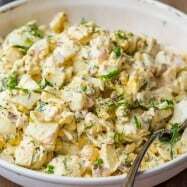 I did change the chives to chopped jalapeno and used cooking spray instead of oil. 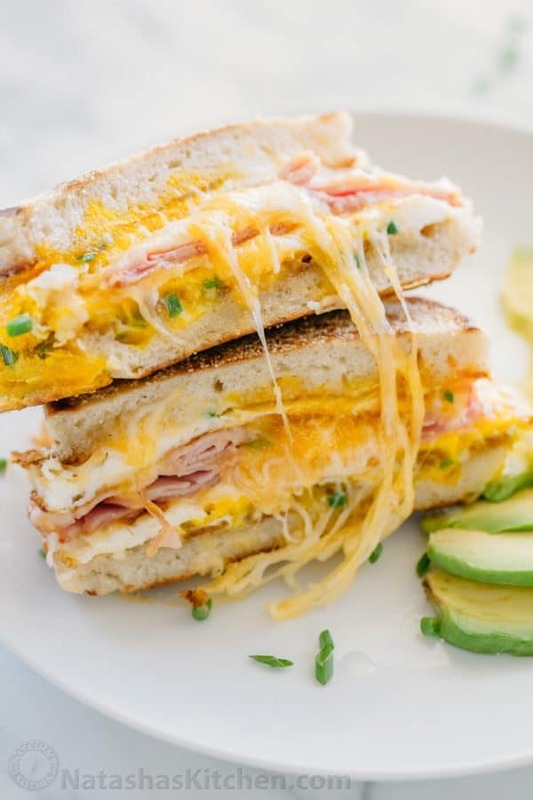 This is a great breakfast sandwich. I have friends coming over next weekend so will prepare this, omit the cheese and jalapeno, but make a white cheese sauce with onion and jalapeno to pour over them. I do not have a picture as my family gobbled them down so fast! That is how much they enjoyed the sandwiches. Thank you! I have done something similar with left over hamburger buns. Thank you so much for as a brilliant idea. 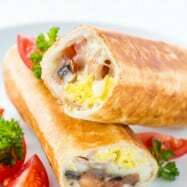 I have tried today in the morning and it was delicious. I didn’t have any ham, but still it turned out delicious. Ha Ha! Still chuckling at how easy this is Natasha! Easy, but Genius! Soooo tasty and wonderfully quick! I substituted some sliced red onion for a crunchier texture (I hope you don’t mind!) which I really love! 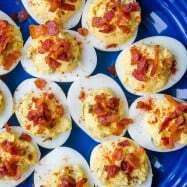 Yet another brilliantly handy recipe from Natasha’s Kitchen! Thank You so much! Keep up the great work on these fabulous videos with hubby!